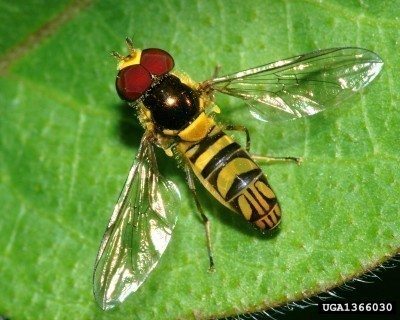 Hover flies are true flies, but they look like small bees or wasps. They are the helicopters of the insect world, often seen hovering in the air, darting a short distance, and then hovering again. These beneficial insects are valuable tools in the fight against aphids, thrips, scale insects and caterpillars. Hover flies (Allograpta oblique) go by several other names, including syrphid flies, flower flies and drone flies. Hover flies in gardens are a common sight throughout the country, especially where aphids are present. The adults feed on nectar as they pollinate flowers. 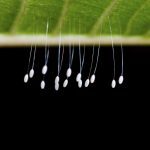 The female lays her tiny, creamy white eggs near aphid colonies, and the eggs hatch in two or three days. The beneficial hover fly larvae begin feeding on the aphids as they hatch. After spending several days eating aphids, the hover fly larvae attach themselves to a stem and build a cocoon. They spend 10 days or so inside the cocoon during warm weather, and longer when the weather is cool. Adult hover flies emerge from the cocoons to begin the cycle again. Hover flies are nearly as effective as ladybugs and lacewings at controlling aphids. A well-established population of larvae can control 70 to 80 percent of an aphid infestation. Although they are most efficient at controlling aphids, they also help control other soft-bodied insects. The bright bands of color on a hover fly’s abdomen probably help to defend the insect from predators. The bright color makes them look a lot like wasps so that predators, such as birds, might think they can sting. You can tell the difference between hover flies and wasps by their heads, which look like typical fly heads. Another identifying factor is that flies have two wings, while wasps have four. Of course, it helps to have an abundance of aphids in the garden too!